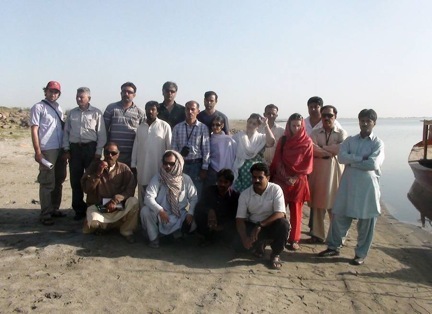 This is a report on a project led by Gill Braulik, Ph.D. and the Pakistan Wetlands Program and supported with a grant from the Aquarium’s Marine Conservation Action Fund (MCAF) in 2010. MCAF supports the Aquarium’s commitment to ocean conservation by funding small-scale, high-impact projects across the globe. Since its founding in 1999, MCAF has funded more than 100 conservation projects in 36 countries and has disbursed more than $600,000 to protect highly vulnerable species and habitats and to conserve marine biodiversity. 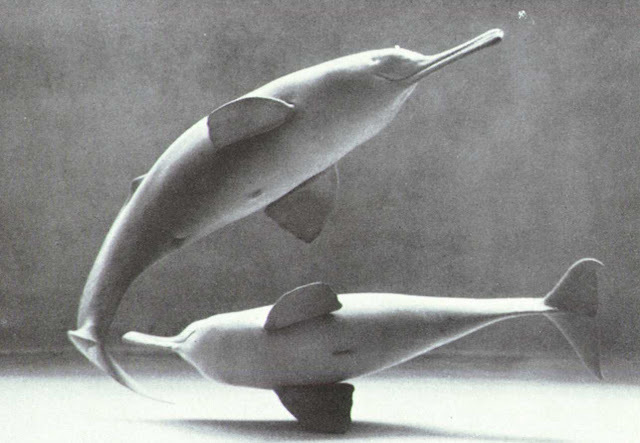 The Indus River dolphin (Platanista gangetica minor) is one of the world’s most threatened marine mammals, with a population size estimated at approximately 1,550 to 1,750 individuals (Braulik et al 2012). The dolphin, which occurs only in the Indus River system in Pakistan and India, has been heavily impacted by poaching, bycatch and pollution. However, the biggest threat to its survival is the fragmentation of its habitat by the dams and barrages that have been constructed on the Indus River for irrigation and flood control. These barriers have reduced the dolphins’ range by 80 percent and have divided them into small subpopulations. Given the small size of each subpopulation and their limited genetic diversity, their ability to persist in the long-term is in question. In August 2010 there was a flood on the lower Indus River, which killed 1,700 people and damaged or destroyed 1.9 million homes. The barrage gates were opened for nearly two months to allow the flood waters to pass, giving the dolphins a rare opportunity to travel freely throughout the river and among the separate subpopulations. Marine mammal expert Dr. Gill Braulik, of the University of St. Andrews in the U.K., was eager to learn how the prolonged opening of the barrages had affected the dolphins’ distribution throughout the river. With funding from MCAF, Dr. Braulik teamed up with the Pakistan Wetlands Program to answer this question. 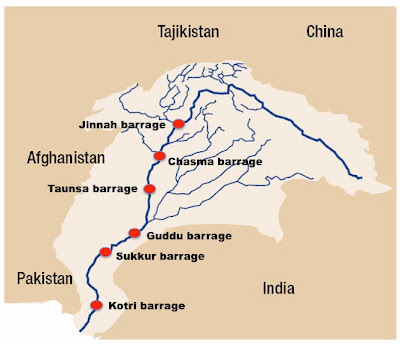 The Indus River: The system of barrages has severely fragmented the Indus River dolphin’s habitat. Map: WWF Map has been altered from original. In the spring of 2011, Dr. Braulik and the Pakistani team traveled 1,000 miles of the Indus River, recording sightings of the dolphins, and comparing the data to previous studies. They learned that the dolphin populations were not greatly impacted by the flood, with one exception. They found a higher than normal number of dolphins downstream of the Sukkur barrage, an area that is mostly dry during the winter. Sadly, the dolphins that have traveled past the Sukkur barrage may be trapped in this marginal habitat, where they are unlikely to survive for more than a few months due to low dry season flows and intense fishing pressure. Unfortunately, the team learned that it is too dangerous to attempt a rescue of the dolphins from this area. Dr. Braulik and her team are now working to understand whether dolphins are continuing to migrate downstream into this unsuitable habitat, presenting a dangerous trend for this highly threatened species. In addition to learning about this downstream migration, one of the other key outcomes of this project was building the capacity of the Pakistani researchers. More than 30 Pakistani researchers participated in the survey, [which] for many was their first opportunity to take part in this type of scientific study and large-scale expedition, to see the river in multiple different locations and to live on the river. This intensive exposure increased their understanding of the dolphin and the threats it faces immeasurably. Almost all participants have returned to their placements with greater knowledge about Indus dolphins, feeling part of a cohesive and supportive Pakistani dolphin conservation team, and more motivated and interested to pursue Indus dolphin conservation. Although the immediate impact of this on the dolphins is not possible to measure, I believe it is vitally important. Although there are many threats facing these dolphins, it is a welcome and significant development to have local researchers trained and motivated to help this species survive. Watch an Aquarium Lecture by Dr. Gill Braulik and Dr. Rohan Arthur. BRAULIK, G.T., BHATTI, Z.I., EHSAN, T., HUSSAIN, B., KHAN, A.R., KHAN, A., KHAN, U., KUNDI, K., RAJPUT, R., REICHERT, A.P., NORTHRIDGE, S.P., BHAAGAT, H.B. and GARSTANG, R. 2012. Robust abundance estimate for endangered river dolphin subspecies in South Asia. Endangered Species Research 17: 201-215.